The Body is a Sanctuary That Floats, Arika. Photo: Storyboard P.
The team behind this year’s episode of Arika – a three day festival of performance, readings and discussions spread across Glasgow’s Tramway, Kinning Park Complex and Many Studios – hold Storyboard P, an Afrofuturist dancing through his own “mutant” flex, in very high regard. Yet even this praise seems to fall short here. Storyboard isn’t dancing on this planet – instead he floats above it. Moving at a different level, occupying a radical plane of being, seducing his audience as prophet, magician and artist, guiding us towards something otherworldly, something that puts a smile on your face. Flex is a form of street dance that’s typically more narrative than break dancing and is characterised by its blended use of contortion, pantomime, popping, voguing and krumping. 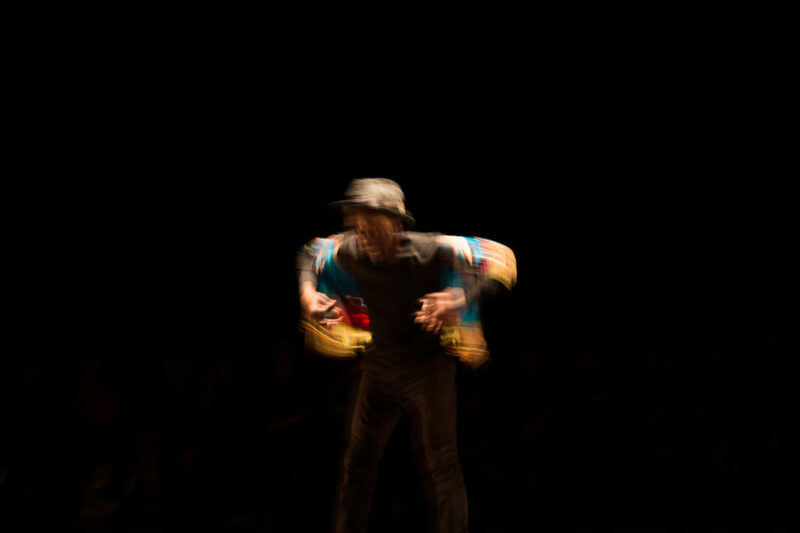 The result here is The Body is a Sanctuary That Floats, a dance that jars, that echoes pain, speaking perhaps to the process of a body attempting to transcend itself, and to the act of working through the histories and futures of Afro-diasporic experience. This movement is coupled with gliding, a form of footwork that simulates levitation – like a more sustained form of the moon-walk. Storyboard’s career began with flex. He became one of its stars through his appearance in the video to Jay-Z’s performance of ‘Picasso Baby’ at New York’s Pace Gallery, and through his own YouTube channel. He also brings his signature use of “animation” to the table: a technique in which fluid movements are repeatedly punctuated with stops, abrupt pauses that call to mind the stop-motion animation of Ray Harryhausen’s work in 1981’s Clash of the Titans. On this night at Glasgow’s Tramway, Storyboard reveals to us a way of being that seems to defy gravity and the laws of “how bodies are supposed to move”. He is both erratic and smooth, caught between the motions of his body and floating above the surface of the earth. There’s something incredibly tangible about the way he does this. The music he dances to is his own composition, and it’s complex and layered. It gets inside your body in much the same way as his movement does. Yet there are often pauses between tracks, which to my mind are slightly unwelcome, offering an additional punctuation that isn’t particularly needed. They are just the gaps between songs, and that’s totally fine, but then in a work this transcendent, where the performance is so skilled and articulate, these silences really stand out. Ultimately, though, you can’t help but smile. This has as a lot to do with Storyboard’s presence. Perhaps it’s finely crafted, perhaps it’s totally natural – I’m not sure it matters or anyone cares, because you’re still enthralled under his spell all the same. Through some sort of magic he ensures that slightly hokum interludes – including the time-honoured classic of having each side of the audience cheer to see which is the loudest – seem very natural and entirely appropriate. At one moment he invites others onto the floor and dances with them briefly. The crowd are supportive, behind it, willing the event on. He tells them all to pause and he moves around their frozen bodies. Come the end of the work, he simply lies down on the floor and chats to us, going on so long (and with no sign of stopping) that the Tramway team have to intervene and tell him time’s up. It’s joyous to be so entranced by him – and to feel he’s so entranced by us – and it never feels like he’s showing off, more that he’s just showing up and doing what he does. The Body is a Sanctuary That Floats was at Tramway on November 16th. For more details, click here.